A Leading Saudi Arabia based Phosphate (Fertilizer) producing Company with Processing Facility at Ras Al-Khair top Sr. Management Position (Head of the Department) for their Reliability Department. 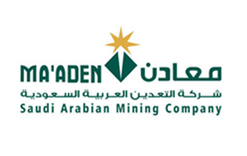 Ma'aden Aluminium Company (MAC), based at Ras Az Zawr, is a joint venture between Ma'aden Aluminium Company, a leading Saudi Arabian Mining Company and ALCOA. It is engaged in building a world-class and state-of-the-art aluminium industry at Ras Az Zawr where it will be committed to an integrated project for the processing of Bauxite ore to produce Aluminium of premium quality.